But first, let me get my awesome brother to take a Célfie! Yes, you heard right. My brother took these photos and the photos from the most previous post. And I think he did pretty well! Anyways, my love for graphic tees has blossomed. I just want a whole drawer full of graphic tees.. is that too much to ask for? So that is my next goal, I'm focusing on my tee collection. Since t-shirts are rather casual, I spiced it up with this flared skirt from LOFT. I know, I'm obsessed with LOFT too. Apparently, I'm obsessed with a lot of things. It's just a part of my personality. I'm definitely type A..and proud of it. Here is why I think it's important to have graphic tee's..but not just any graphic tee's. They obviously have to be cute. I'm not a fan of tee's with profanity or anything like that. 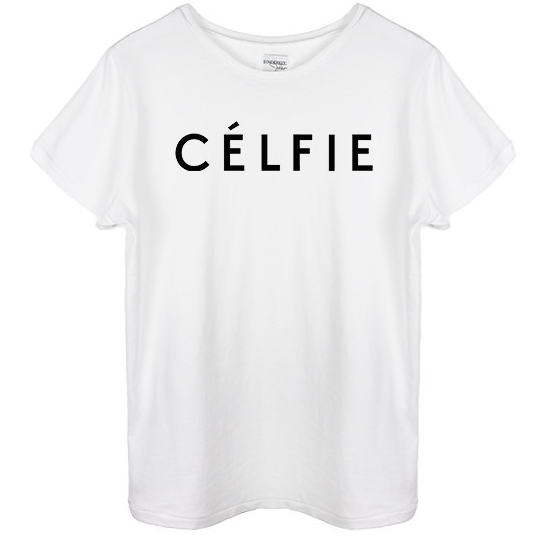 Just the super chic sayings like "Célfie" or pretty much anything about glitter. Graphic tees can be tucked into just about any skirt or worn with jeans. It truly depends on how you would like to style it. Since the outfit is just black and white, I decided leopard flats would be a fun addition. And again, since the outfit is simple I thought the more accessories, the more fun! So on went a whole bunch of B&B. Back to the topic of skirts. I'm usually not very into skirts, I typically prefer jeans. But recently I've been more attracted to skirts. It's for that reason that I'm focusing on wearing skirts more, as well as re-styling them so I get the most possible use out of them. This black skirt from LOFT can literally be worn SO many ways. So if you are hesitant about skirts, this is definitely one that would be a great first choice. If you're more of a crop top kinda gal, a cute fitted crop top or even a loose crop top would look cute with this skirt. So if there's an item you're just dying to try but just aren't too sure, just dive in. Get it, style it, and own it. Always remember, I'm just an e-mail away if you need some styling advice! And since I'm on a graphic tee kick, stay tuned for more graphic tee style from yours truly.